Tape, prime, paint. Tape, prime, paint. Over and over and over again. Okay, so there are a few steps in between….like washing the walls and spackling and sanding and such. I never knew I would learn so much about home renovation before 30 but it’s happening. It is really happening. We’re moving. I hate to leave our old farm house. But, technically it isn’t ours. We love it here. We love our view. We love being way out in the middle of no where. We just plain love it. But for a variety of reasons we are opting to move to his parents home because they will be moving as well. So as we all get ready to move we have started on the renovations to make their home now our home for a bit. 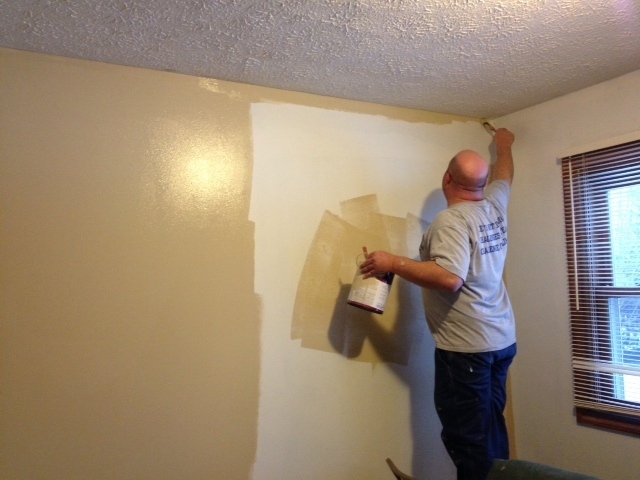 Currently we are painting….in hopes that we can get what we want painted before we get new carpet. There are highs and lows to moving. Right now the lows are removing border and the entire process of painting. It makes me wonder if in 5-7 years (our plan) that I will really want to build or buy a home. So far I am loving our paint choices but honest to goodness never want to do all this again. Painting is not my friend. Just ask Michael. I get whiny and take lots of breaks. I’m trying to be a trooper, but frankly this stuff is for the birds. So far we have the office and spare bedroom done. We got started on the upstairs hallway tonight as well. I’m trying really hard to document before me after pictures but I keep forgetting! Soon I will post more. For now I have a photo of my hottie handy man.